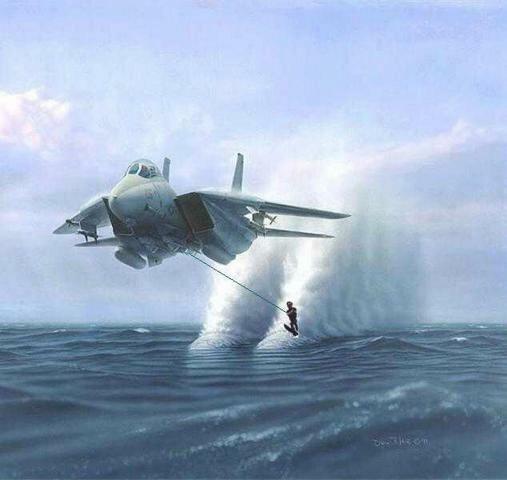 Enjoying his summer, Mr. D. is seen here water skiing behind a friend's craft. Since this is a summer class, and we should all be outside somewhere having fun instead of sitting in some dusty old cubbyhole. Therefore, much of your homework for this class will be to get out and have fun. And then we're going to write about that fun. The first paper, I'll call a "secret treasure" essay. Then we will do a restaurant review, and entertainment review, a descriptive analysis of a major attraction in the area, and a persuasive piece: "what this area really needs is..." The final major project will be the web folio. Last Updated: 6/13/2001, 8:00 a.m. Readings: Define what an essay is and what a thesis statement is. At the start of class, print drafts of paper #1, exchange w/ two colleagues, and do peer review per instructions on my handout. Then make the paper perfect and turn it in for me to grade. Paper #1 = 6 pts. Readings for Tues., 5/29: Four to six restaurant reviews. For reviews of area restaurants, take this link to the DailyPress.com, then click on "dining" in the frame on the left of the Daily Press home page. Errors analysis of paper #1 due at end of class. 2 pts. Documentation exercise (a summary or quote which you will actually use in your paper), 2 pts. Sample of a quote used in a restaurant review. Due at start of class: 1) The quoting exercise. This is one paragraph which you will actually use in paper 2, a paragraph in which you correctly quote a source. It includes the correct, MLA-style works cited. Follow my sample quote exercise. 2 pts. 2) Draft of paper 2 (the restaurant review) for peer review. It will be turned in to me to grade at the end of class today. 6 pts. Note: 1/2 way through class, I will demonstrate how to upload paper 1 onto your web site, so be sure you have paper 1 with you, saved on disk with all corrections made to it. Readings for Mon., 6/4: Two movie reviews, two concert reviews, two other entertainment reviews. Errors analysis of paper 2 due at end of class. 2 pts. Errors analysis of paper 3 due at end of class. 2 pts. Errors analysis of paper 4 due. 2 pts. Assignment for Monday 6/18: Access and read the other web folios. Proof them carefully and provide feedback to your colleagues regarding links that don't work, annoying scrolling from side to side, html code or other characters inadvertantly saved in the text of the papers, etc. Apply the webfolio evaluation criteria I have supplied when you critique the web folios--including your own. Use email to contact each other. Corrections to paper 5 due. 2 pts.